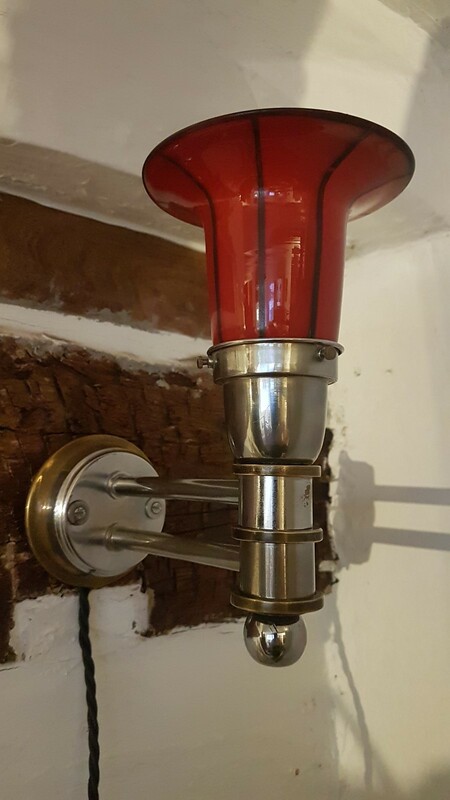 Wonderful 1950's brass and chrome wall light with the original hand-blown red glass shade with painted black strip lines one the outside. It is in very good condition with the exception of one area that has has lost its chrome plating as can be seen in the pictures. This light has been rewired to show it working but when fitted to your property it will need to be fitted by a professional electrician. The red glass shade gives off a very atmospheric ambiance when switched on. It measures 22cm high by 20cm deep by 10cm wide with a shade diameter of 13cm.